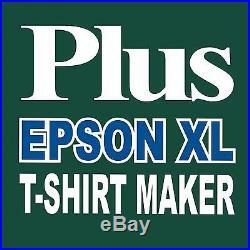 EPSON XL DIGITAL PRINTER T-SHIRT MAKER. 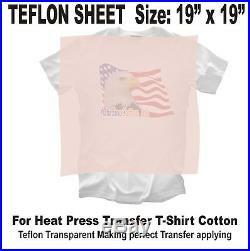 PLUS BUNDLE HEAT TRANSFER MACHINE 16″x20″. T-SHIRT PRINT TRANSFER COMPLETE STARTER PACKAGE. The Best Digital Printer with Low Cost ink with refillable ink for Your T-Shirt Printing Business. Epson Printer Digital Machine Refillable ink c artridge continuous inks system (CIS) and Heat Transfer Press Print T-Shirts 100% Cotton and most Cotton/Poly blends colored and dark, low cost replacement ink bottles, quick easy refillable cartridge lets use over and over again ready to use and handle high-volume printing projects. The best digital ink print direct performance with Epson driver software, combining auto photo Color profile; ICC(International Color Consortium) doesn’t need any other driver. 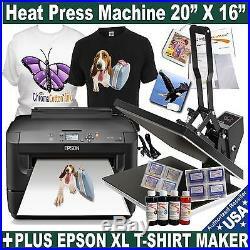 CD software design make personalized T-Shirts and Gifts with 18,000 clip art images and design ready easy to edit. (11″x17″), Super B (13″ x 19″), letter (8.5″ x 11″), legal 8.5″ x 14″. 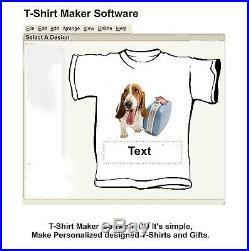 S tart Printing T-shirt and More… T-Shirt Maker CD software It’s simple. Cotton fabrics, Jackets, Mouse pads, Pot Holders, Wallets, Aprons, Baby Bibs, Tote Bags, Towels, Flags, gifts, Kids Stuff, Holidays, Souvenirs, Birthdays Gifts, and other more.. Water resistance, light fastness, and rub fastness. Durable wash after wash. Chemically heat transfer ink. Free of clogging print head the nozzle. Auto color connection with printer. Windows and Mac-OS/OS X. Replacement Ink bottle Print more than 1,650 T-Shirts. Chromcotton (TM) ink color profile formulate & made in USA. Certified/Approved ICC(International Color Consortium). PACKAGE INCLUDE EVERYTHING YOU NEED FOR START-UP. Digital Automatic Timer Heat Press Machine. Heavy Duty Design, -Wide Opening. High Pressure Adjustment. Teflon non-stick Coated Heating Plate. Fully Digital Adjustable Temperature Control: 0-500F. Digital Automatic Alarm Timer 1-999sec. Brand New, Individually Wrapped with molded foam package and User’s Manual. SON DIGITAL PRINTER XL EPSON WF- XL R EFILL INK CARTRIDGES. T-SHIRT MAKER Chroma cotton. SOFTWARE OPERATIVE SYSTEMS CD FOR DRIVER PRINTER AND INK. Windows Vista®, XP , XP Professional x64, Windows 7, 8, 10 (32-bit, 64-bit). Mac OS®5 X 10.4.11, 10.5. X, and 10.7x. CD SOFTWARE – T-SHIRT MAKER. 18,000 clip art images. 4 INDIVIDUAL INITIAL INK CARTRIDGES. R eady to use, (1) Black, (1) Cyan, (1) Magenta, (1) Yellow. 4 INDIVIDUAL REFILLABLE CARTRIDGES. To Be Fill (1) Black, (1) Cyan, (1) Magenta, (1) Yellow. FOR REFILLING CARTRIDGES (Non-Oem) 1 ChromaCotton Ink Bottle (K) Black 60ml. 1 ChromaCotton Ink Bottle (c) Cyan 60ml. 1 ChromaCotton Ink Bottle (M) Magenta 60ml. 1 ChromaCotton Ink Bottle (Y) Yellow 60ml. 4 SYRINGES LONG BLUNT NEEDLE REFIL INK. 10 CHROMACOTTON T. PAPER 8.5×11 LIGHT T-SHIRT. 2 CHROMACOTTON T. PAPER FOR LIGHT T-SHIRT 11X17. 5 CHROMA-COTTON ONE-STEP OPAQUE. PAPER 8.5×11 DARK T-SHIRT. 1TEFLON Non-Stick SHEET 19″ x 19″. 1 T-SHIRT 100 % COTTON. INSTRUCTION how to filling ink. INSTRUCTION How to install the printer. INSTRUCTION How to Print T-Shirt. T-Shirt Maker CD software Design It’s simple, just with 3 steps. 18,000 clip art images, thousands of ready made designs. Fun font effects for arching, stretching, squeezing words. This software have the Ability to take an image from your computer or camera and print. Design, Pick a design, add. Print, Print Transfer Paper with chromacotton ink. Press, Heat press and Peel, makes printing perfect every time. Compatible Formulated Chroma Cotton. 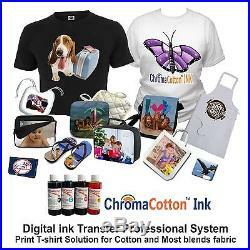 Chroma Cotton ® Digital ink refillable for print T-shirt 100% cotton fabrics and most cotton b lends Cotton/Poly. Digital heat Transfer ink color patented chemical bright color water-proof ink- cross print applied under heat and pressure transfers the image into cotton (T-shirt) and most blends fabrics using special coating paper chromacotton, resulting a customized full-color printed image soft bright quality durable wash after wash that will not peel due to the non-fade color ink profile approved ICC. P rint-cross-platform color management does defining color connection resulting USA-CE Certified. Print auto performance combining with printer driver software (PC-Windows and Mac-OS/OS X) and doesn’t need any other driver. To transfers on black or dark colored T-Shirt use one-step opaque chromacotton heat transfer specifically paper it is thick white background enough to block out underlying T-shirt color. Chromacotton ink have been tested and run successfully on most standard brands of inkjet printers. DIGITAL EP SON PRINTER WF- XL T-SHIRT MAKER PRINTER. 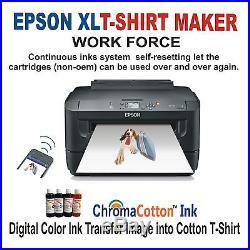 A powerful, high performance T-shirt printer, the Epson WorkForce. Go big with professional prints up to 13″ x 19″. Easy-to-use, Individual refill ink cartridges(oem) can be used over and over again and replace only the color that you’need. Cyan, Magenta, Yellow and Black. This printer has special chromacotton ink for cotton This budget-conscious performer is ready to handle all your high-volume printing projects. Printing Technology: 4-color (CMYK) drop-on-demand MicroPiezo® inkjet technology. Minimum Ink Droplet Size: 2 droplet sizes, as small as 2 picoliters. Maximum Print Resolution: 5760 x 1440 optimized dpi. A4 (8.3″ x 11.7″), letter (8.5″ x 11″), legal (8.5″ x 14″), 11″ x 14″, 12″ x 12″, B (11″ x 17″), A3 (11.7″ x 16.5″) and Super B (13″ x 19″). Windows 7, 8, 10 (32-bit, 64-bit). Software Driver Included : Epson printer driver, Web to Page and Epson. Color Management: Auto Photo Correction, Epson Vivid Color, Adobe RGB and ICM. Printing: 22.2″ x 27.2″ x 15.0 (W x D x H). Standard Connectivity: – Hi-Speed USB 2.0 – Wireless (802.11 b/g/n). Wired Ethernet (10/100 Mbps). 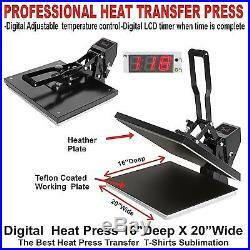 Digital Automatic Timer Heat Press 16″ x 20 “. Is ideal for heat applying such items as t-shirts, jackets, mousepads and more. It is heavy duty and equipped with an automatic timer. This model is our most popular heat press! This press is ideal for environments with space limitations, and for users who need more portability and mobility. Than the over-weight swing-away presse s. Heavy Duty Design. Fully Digital Adjustable Temperature Control: 0-575F, 0-260C. Power:1800 watts. Dimensions: 27 x 16 x 14. Keeps the upper heat platen clean. And to prevent colors from bleeding through. The Teflon sheets are re-useable and last a long time. Made of premium Teflon and fiberglass materials. Heat rated: up to 650 F hickness: 4 mil. Corporation manufacturers are registered trademarks. All of the Printer from us, come from authorized. Epson, Canon, Brother Ricoh, Hp.. Which has not manufactured or approved chromacotton transfer T-shirt maker. You may not: modify or copy the materials; use the materials for any commercial purpose, or for any public display (commercial or non-commercial). We believe the good communication will resolve any issue. Your satisfaction is our priority. We accept return on this item within 14 days from the date you receive the package. The item “HEAT PRESS 20X16 MACHINE PLUS EPSON PRINTER INK CIS T-SHIRT MAKER START PACK” is in sale since Sunday, August 28, 2016. This item is in the category “Computers/Tablets & Networking\Wholesale Lots\Printer Supplies & Accessories”. The seller is “carlabrshop” and is located in Bogota, New Jersey. This item can be shipped to United States.